I saw my very first puppet theatre on television. It was a performance of Phra Abhaimani by Piak Prasertkul sometime between 1946 and 1956 when the TV station was newly established. I was 12 years old, studying in Grade 9 at Vajiravudh College. After seeing the puppet performance, I started making my own rod puppets with materials such as crustacean shells, egg shells and wood. I made use of broken paintbrushes for the rod which is the body of the puppet and joss sticks as hand-extenders (the so-called �chopsticks�). I made the scenery with doorways for the entrance and exit. It was a toy puppet theatre I played with. I was both performer and spectator, watching myself play in the mirror. When I was at the Faculty of Painting and Sculpture, there were field trips to study Thai art at the National Museum. I saw a lot of antiquated puppets there. So, I made toy puppets of about 8 inches tall, using bamboo reeds as rods and old paintbrushes as �chopsticks�. I painted the scenery for a small theatre in proportionate size. Then, in 1974, I met Khru Chuen (Prasertkul) Sakulkaew, who had inherited the family business of the Nai Piak Prasertkul Troupe. 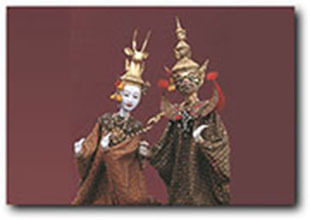 I started collecting puppet heads from this troupe, sold to me by Khru Cheun. Seeing my interest in puppetry, she also taught me puppetry. I restored the heads to their perfect condition. �The Association of Volunteer Housewives� asked to display them at the Siam Society at an exhibition entitled �Hobbies�. The display received a lot of interest which encouraged me to make the bodies for the heads and new puppets to complete the set for the episode. On 18th July 1975, the amateur puppet troupe called Chakrabhand Posayakrit Puppet Theatre staged a production at the small auditorium of the National Theatre, organised by the Association of Volunteer Housewives. The proceeds from the box office went to charities selected at royal discretion. Princess Sirindhorn saw the production of the episode of The Escape from the Sea Ogress from Phra Abhaimani. There were four performances and Khru Chuen Sakulkaew was invited to take part in every performance as senior master. At the last performance I was introduced to Khru Wong Ruamsuk, the owner of the Chucherd Chamnansilp Puppet Troupe from Amphawa, Samutsongkram, who had seen the show too. After that, I visited him at Amphawa and learned another style of puppetry from him. In 1976, Khru Chuen sold me the whole puppet collection, including puppets used for the principle parts of Nai Piak�s troupe together with puppet cabinets, but excepting the character, Sinsamut, and some hermit teachers� heads. The puppet heads I obtained from Khru Chuen between 1974 and 1976 and this became the very first puppet collection of Nai Piak Prasertkul since 1899. 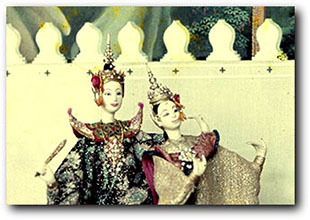 In May 1977, the Chumbhot-Pantip Paribatra Foundation and the Composers Society organised a production of the Chakrabhand Posayakrit Puppet Theatre featuring the episode of The Floating Lady from The Ramakien for two performances at Suan Pakkad Palace, the proceeds of which went to charity. Khru Chuen Sakulkaew and Khru Wong Ruamsuk were invited to the performances. After that, this puppet theatre had a two-year respite, being an amateur troupe, as earlier mentioned. In February 1979, the company went to Chiangmai to stage three performances of the episode of The Escape from the Sea Ogress from Phra Abhaimani. It was for charity and the proceeds went to the Girl Guide Association of Thailand under the Queen�s patronage. Khru Chuen also accompanied the troupe in these performances. In May of the same year, the episode of The Floating Lady from The Ramakien was staged again on television on Channel 9 but the performance was edited to an hour�s length. As before, Khru Chuen was in the production. 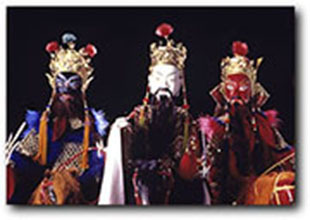 There was a long interval while the Company prepared for the Chinese-inspired puppet production of the episode of The Battle of the Red Cliff from The Three Kingdoms, The project that had started in 1978 was staged in 1989. 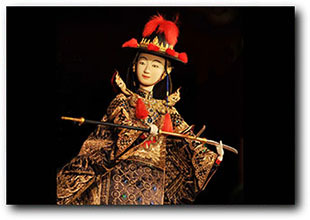 The puppets were clad in exquisitely-crafted old Chinese theatrical costumes. Khru Yuen Bhanudat, an embroidery expert who had learned her art from the royal household in the reign of King Rama V, taught the art of embroidery with the sequin and gold thread in the old palatial fashion. 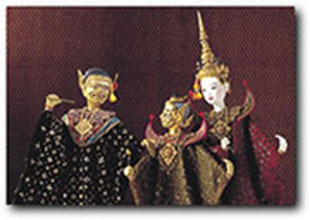 In 1990, the puppet theatre in the Taleng Phai collection was conceived. Construction and preparation got underway way and it is currently being staged in an open-house rehearsal on a regular schedule.